One imagines the people behind this weekend's top new film looking at the schedule for April and thinking, “Well, at least that opening weekend is locked down.” I mean, it probably still is, but you're not breathing as easy as you were one weekend ago. Another in the line of video game adaptations, Rampage wears its origins pretty loosely on its sleeve compared to the side-scroller it came from. In the game, humans transformed into beasts were set about to destroy cities, where in this movie, genetically modified animals (Hollywood's heard of CRISPR now, people!) are sent out into the world to do the destruction themselves, followed by kindly primatologist Dwayne Johnson (who could probably punch a building over on his own anyway) who's attempting to save his charge, a gorilla named George. What follows, then, is 90 minutes or so of CGI animal mayhem from the camera of director Brad Peyton, who's worked with Johnson twice before in San Andreas and Journey 2: The Mysterious Island, both themselves containing a high level of random action, and each inexplicably popular despite their generic looks. This was due, no doubt, to the presence of Johnson, who after a couple of fits and starts, has become the action star he's been trying to be for the better part of two decades. Things really kicked off for him after joining the Fast & Furious franchise. It hasn't been complete smooth sailing since then (Hercules? Baywatch?) but he's been good for a solid level of hype on all his movies, which is half the battle. This looks like it'll be closer to that weaker group rather than more successful ones, but coming off the Jumanji sequel, Johnson definitely has momentum on his side. Also starring Naomie Harris, Jeffrey Dean Morgan, Malin Akerman and Joe Mangianello (but really, who cares. Monsters! Destroying! ), it looks headed for about a $30 million opening weekend. When you look at the premise of Truth or Dare, you start to wonder why a horror film like this doesn't exist yet – until you realize there's been at least three in the last three years with the same general idea, they've just been low budget garbage dumps. This version, from buzz indie studio Blumhouse, ups the ante a little but not to a huge degree, other than the marketing. 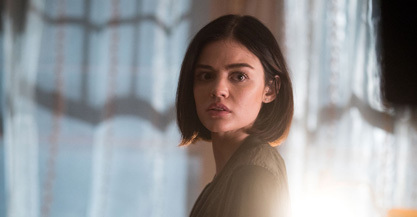 Starring Lucy Hale and a bunch of other anonymous teen and 20 something actors, it goes off the basic idea of Truth or Dare, but makes it real if you refuse the dare or lie, Final Destination style (an evil spirit has followed them back from a trip to Mexico, which makes this a new entry in the “foreigners are all gonna kill ya” genre). It's a pretty witless looking film overall, and reviews peg it as a rather inferior entry in Blumhouse's stable (they got a Best Picture nomination last year, I mean what? ), and which should debut at about $9 million, buried in the wake of A Quiet Place.